Here is a brief summary of the narrative of Mary Rowlandson's captivity entitled, The Sovereignty and Goodness of God. For the complete manuscript see the "Links" page. On February 10, 1676 a group of Indians, fighting in King Philip’s War, attacked the town of Lancaster, MA. The Indians spent the whole morning ravaging the town, killing many, wounding more and eventually, when it was all over they took 24 hostages. Among those hostages was Mrs. Mary Rowlandson, wife of the local minister, and her three children. However, the Indians split up the captives, therefore Mary was separated from her two eldest children, except for a few short visits during her captivity. Mary herself he been shot in the side during the attack, and the bullet also hit her six-year-old daughter Sarah, who subsequently died eight days later. Sarah’s tomb can be found in New Braintree, MA. Shortly after Sarah’s death Mary was permitted to see her son and daughter who had been separated from each other. Throughout the rest of Mary’s captivity she would see her son a few times but would not see her daughter until the end of the war. 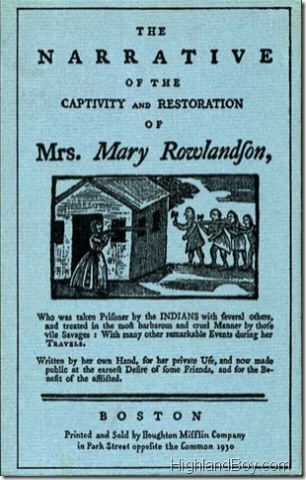 Mary Rowlandson wrote an account of her captivity, in which her time spent with the Indians is broken into 20 removals. In other words, the 20 places were they camped for a period of time. According to Mary’s account, the captives were sold off like slaves, to specific Indian families. Mrs. Rowlandson talks a great deal about trying to find food for herself, because often her master would not feed her. Therefore, she would scout around the camp to find a kind soul or to barter for some food. Mary also mentions that during the third removal, the Indians had raided another town and had gathered in their bounty a Bible. This Bible was given to Mrs. Rowlandson, and she found great comfort in this Bible throughout her captivity. During the eight removal, Mary Rowlandson was brought to see King Philip. The King requested that Mary sew a shirt for his son, and in return he gave her food. Soon many of the Indians were asking Mary to sew clothes for their families, and in return she received food. Once she received a knife, which she was forced to hand over to her master. 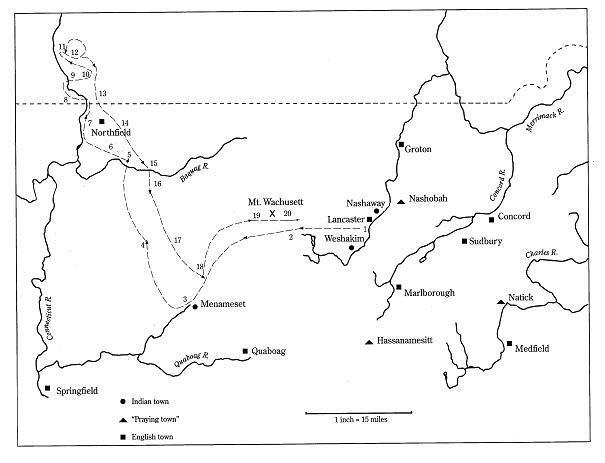 After Mary meet with King Philip, the Indians started to move back towards Lancaster. Mary was told that she would be sold back to her husband, which cheered her. However, this cheer did not last long. Many of the Indians, especially her master’s wife, began to taunt Mary. The told her that her son had been roasted and eaten by the other Indians, and that her husband was dead, or remarried. Mrs. Rowlandson became very upset, enveloping herself in her Bible to find some comfort whenever she was able. During the sixteenth removal, Mary was informed that she was to be taken to Wachusett, so that her release could be negotiated. By the twentieth removal, they had reach the Wachusett Hills. Mary was asked to estimate a ransom price that her redeemer could pay. After some deliberation, the sum of 20 pounds was concluded a reasonable amount. The man, who came to save Mary, was not her husband, as she had hoped, but was instead a man named John Hoar. Mr. Hoar meet with a small group of the Indians to negotiate from Mary’s release. Among those Indians were Mary’s masters and King Philip. The Indians then held a council in which every member, except for King Philip, agreed to release Mrs. Rowlandson. This agreement was made at Redemption Rock on May 2, 1676. As a result this inscription was carved into the rock so that all may know of the story of Mary Rowlandson. Shortly after Mary’s release she was reunited with her husband, and together they went in pursuit of their children. By the end of King Philip’s War the Rowlandson family was together again. Mary Rowlandson went on to write her narrative about her captivity. Since Mary died in the year 1678, and her book was not published until 1682, Mary never experienced the fame her book acquired. Today her story is known as the basis for all captivity narratives. It became an instant best seller, and is considered a literary classic, especially being written by woman of that time period, which was quite rare. ¹ History of Redemption Rock Also History of the American Indians (Fitchburg, MA: Joseph Mason), 1.